The most important part of any viral life cycle is to get inside a cell. When any new virus is discovered, the most important research that needs to be immediately done is find the receptor in the cell. More easily said than done, I recently came to an understanding that there are some criterions to call a virus receptor as a functional receptor. I have only known part of this story and so I scanned up literature in depth and had some understanding of the concept. There is no single methodology for identifying virus receptor since the virus can bind to proteins glycans etc. Sometimes a virus can have more than a single receptor or sometimes receptors or viral proteins need to be modified by an enzyme and so on and so forth. However, most of the virus have a straightforward binding with cellular membrane receptors. This where a technique called as Virus Overlay Protein Binding Assay (VOPBA) comes in. The idea and popularisation of VOPBA technique largely credited to Richard Hegele, In an attempt to find the receptor for RSV. In the first experiment, the cellular membrane was digested with enzymes such that you end up with only proteins, fat or carbohydrates. This preparation was then infected with RSV and found that cells lacking protein in cell membrane showed no infection, mean to say that the virus was using proteins as the receptor. The next step is to identify the protein. For this, the membrane proteins are separated in a gel, blotted out and virus particle is added. The virus binds to the protein, that forms the receptor and is identified by using antibodies against the virus. The gel band is cut, digested and the protein is isolated and identified using Mass Spectrometry. This technique can be used to identify almost any receptor, though the details of the technique varies widely. The technique can be modified by including the receptor array on a microchip (for example glycan array for Influenza), which can be used for identifying the receptor. 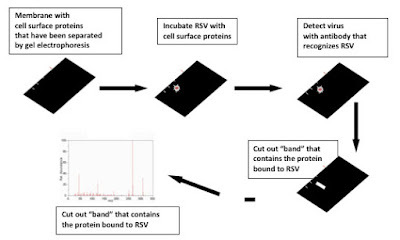 One of the most common questions about identification of virus receptor is verification. How do you actually prove that indeed the one identified is the functional receptor? There are a set of criteria. I'm not sure if one should call it postulates of receptor identification, but I have seen literature that implies they are. Cells lacking the receptor should be resistant to infection. Introducing the receptor molecule in a non-susceptible cell line should / could confer susceptibility. Competitive binding of the receptor should reduce infection. The rules look quite straightforward. It should be possible for the virus to infect cells carrying the receptor (That's the whole point). If you are to introduce the receptor into a cell that doesn't have one, that should be infectable too. This may not be true always since some cell lines can be non-permissive. So a better approach is to knock out the protein gene and (or) silence the protein production using siRNA and show reduced infection. Antibodies that bind to the receptor masking the binding site should be able to block infectivity and if there is a competitor protein or chemical that can bind to the receptor it should be possible to reduce the infection rate. I understand that this rule is not universal and cases of exception exist. If at least a couple of rules hold up, then it is safe to call the receptor as a functional receptor.